These symptoms are the nose’s natural response to inflammation and irritation. They are often associated with itching of the eyes. Rhinitis treatment When no specific cure is available for your chronic rhinitis, options include ignoring your symptoms, avoiding or decreasing exposure to irritants or allergens to the extent practical, and taking medications for symptom relief. Once allergic rhinitis is diagnosed, treatment options include avoidance, medication and immunotherapy (allergy shots). Avoidance – A single ragweed plant may release 1 million pollen grains in just one day. The pollen from ragweed, grasses and trees is so small that the wind may carry it miles from its source. Mold spores, which grow outdoors in fields and on dead leaves, also are everywhere and may outnumber pollen grains in the air even when the pollen season is at its worst. While it’s difficult to escape pollen and molds, here are some ways to lessen exposure. • Keep windows closed and use air-conditioning in the summer, if possible. Automobile air conditioners help, too. • Don’t hang clothing outdoors to dry. Pollen may cling to towels and sheets. • The outdoor air usually is most heavily saturated with pollen and mold between 5 a.m. and 10 a.m., so early morning is a good time to limit outdoor activities. • Wear a pollen mask (such as a NIOSH rated 95 filter mask) when mowing the lawn, raking leaves or gardening, and take appropriate medication beforehand. Medication – When avoidance measures don’t control symptoms, medication may be the answer. 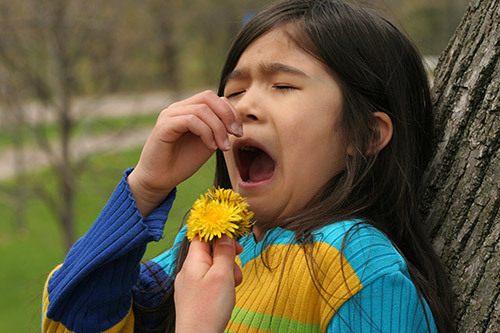 Medications help to reduce nasal congestion, runny nose, sneezing and itching. They are available in many forms, including tablets, nasal sprays, eye drops and liquids. Some medications may cause side effects, so it is best to consult your allergist if there’s a problem.